Howie Morenz started his first game with the Mitchell Juveniles in 1916-17 as the team's netminder, however it quickly became obvious that he was more suited for an offensive role with the club. To paraphrase the lyrics of an Elton John song, 'His candle burned out long before his legend ever did.' So goes the extraordinary saga of Howard William Morenz, best known as Howie, the incredible superstar of the Montreal Canadiens and arguably the best player in the National Hockey League between the First and Second World Wars. Born September 21, 1902 in the town of Mitchell, Ontario, the All-Star centre actually began his career as a goaltender, but after a game in which he let in 21 goals, was fortuitously converted to a rover by his coach. Using blazing speed as his biggest asset, all who saw Morenz play immediately realized that an offensive role was much better employment of the teenager's assets. 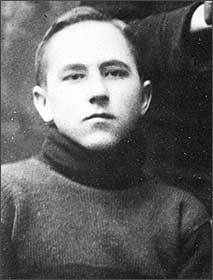 In 1916-17, a season in which he began playing goal, Howie led Mitchell to the Western Ontario juvenile championship. The family moved to nearby Stratford, and in 1917, Howie attempted to join the army but was thwarted by his mother, who let recruiters know that the boy who professed to be 18 years old was actually just 15. In Stratford, Howie starred with the junior Stratford Midgets and, along with linemate Frank Carson, was frequently summoned to join Stratford's senior squad. After scoring 9 goals in one contest, NHL teams were alerted to the talented youngster. The Montreal Canadiens wooed Morenz with a $400 bonus to join them for the 1923-24 season, much to the chagrin of the Toronto St. Patricks who valiantly pursued the hockey prodigy. After signing his contract, Howie had second thoughts about playing professionally, thinking he was not yet ready to play professionally. Montreal's owner/manager Leo Dandurand threatened that Morenz would either honour the contract or not play hockey at all. Begrudgingly, Howie joined the team and in no time, proved that he was more than ready to compete at hockey's highest level. 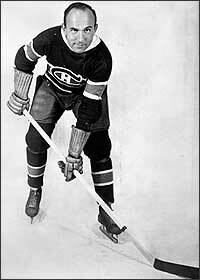 During his rookie season, 1923-24, Morenz scored 13 goals in 24 goals, but proved invaluable when he led the Canadiens in playoff scoring as they marched to the Stanley Cup. That spring, the NHL champion Montreal Canadiens eliminated the PCHL champion Vancouver Maroons in two straight games, earning a berth in the Stanley Cup final against the WCHL champion Calgary Tigers. The best-of-three final saw Montreal need just two games to dump the Tigers, with Howie scoring the Stanley Cup-winning goal at 1:16 of the first period in a 3-0 Montreal victory. Morenz led the playoffs in scoring with 4 goals and 6 points in 4 games. Acknowledged as one of the game's first superstars, Howie's blazing speed and scoring prowess filled arenas wherever Montreal played. In 1927-28, Howie ran away with the scoring championship, scoring a league-best 33 goals and adding 18 assists for 51 points. He was also named the Hart Trophy recipient as the NHL's most valuable player. He scored 40 goals and had 50 points in 1929-30, then led the Canadiens to a second Stanley Cup championship that spring. Facing the Boston Bruins, who had finished 21 points higher in the regular season standings, the Canadiens gave the Bruins their first back-to-back losses of the entire season, taking the best-of-three final in two games. Howie again scored the Stanley Cup-winning goal in 1930. The next season, Morenz again led the NHL in scoring, firing 28 goals and 51 points, feats deserving of a second scoring championship, a second Hart Trophy win and selection to the NHL's First All-Star Team. Once again, the Montreal Canadiens won the Stanley Cup; the third and final such victory for Howie Morenz. In 1931-32, Morenz was awarded the Hart Trophy for an unprecedented third time, also earning First All-Star recognition. In 1932-33, Howie sustained minor injuries and saw his production drop substantially. Nevertheless, he was still selected to the Second All-Star Team. 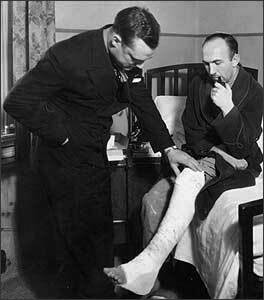 A broken ankle felled Morenz during 1933-34 and his point total dipped to just 21 points. Frustrated, Canadiens' fans saw fit to boo their hero, angering the star centre. Just prior to the 1934-35 season, he was traded to the Chicago Black Hawks along with Marty Burke and Lorne Chabot in exchange for Lionel Conacher, Roger Jenkins and Leroy Goldsworthy. Morenz never felt comfortable in Chicago, and during 1935-36, found himself benched. On January 26, 1936, he was traded to the New York Rangers for Glenn Brydson, and finished that season in New York. Meanwhile, the Montreal Canadiens were struggling and prior to the 1935-36 campaign, new owner Ernest Savard asked Cecil Hart to manage and coach his team. Hart agreed on the condition that Morenz be brought back to the club. 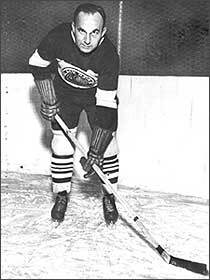 Hart, as well as the team's owners, expected Howie to be a morale booster for Montreal when they purchased his contract on September 1, 1936, but during that season, Howie was producing regularly on a line with old teammates Aurele Joliat and Johnny Gagnon, helping Montreal finish first in their division. "The old spirit is back," he told reporters, shaking their hands as he entered the Montreal Forum again as a member of the Canadiens. Although a shadow of the star he had been in his first go-round with the Canadiens, Morenz was happy. "There was something missing inside when I was away the last two seasons," he stated. "I got it back when I came back with the Canadiens. I'm giving the fans everything I've got. The end may be in sight but the heart is still sound." No one attending the Canadiens' game on January 28, 1937 could have anticipated that they were witnessing the final game played by Howie Morenz. Early in the first period, Morenz raced into the Chicago zone, followed closely by Earl Siebert of the Hawks. Howie's legs slipped from under him skating full speed and he crashed into the end boards. The blade of his skate got caught in the wooden boards and Siebert, unable to stop, crashed headlong into Morenz. The momentum snapped Howie's leg in four places. Helped off the ice, Morenz was rushed to Montreal's Hopital St-Luc. Morenz sobbed, not through pain, but because of the finality. "I'm all through," he told teammates. "This is the finish." Doctors stabilized the leg, which was broken in four places between the knee and ankle, by inserting a pin to shore up the broken bones. He was placed in traction to assist the bones in meshing together properly. There in his hospital room, he was besieged by visitors, to the point that hospital officials had to restrict the number of people visiting him. But Howie knew that his career was over, and that prospect devastated the star athlete. A coronary embolism caused by blood clots formed in his shattered leg finally ended Howie's life on March 8, 1937. But in actuality, as teammate Aurele Joliat articulated, Howie Morenz truly died of a broken heart. Six weeks after having his career ended so suddenly, 34-year-old Howie Morenz was dead. 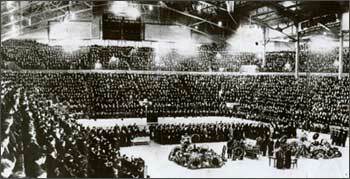 The Canadiens held his funeral in the Montreal Forum on March 10, and 50,000 fans passed by centre ice where his casket rested. At the conclusion of the service, eight teammates lifted the casket and carried it to a waiting hearse. Almost a quarter-million fans lined the streets of Montreal as Morenz's cortege took him on one final ride. Howie's number 7 was retired on November 2, 1937. Five days later, the NHL All-Stars faced a squad of combined Canadiens and Maroons in an exhibition contest with proceeds donated to Morenz's widow and family. This contest predates the first official All-Star Game, but similar to other charity contests, certainly paved the way for the annual game. 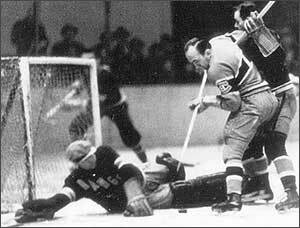 Through 550 regular season games, Howie Morenz scored 271 goals and added 201 assists for 472 points. One of the greatest centres to ever pull on a Montreal Canadiens sweater, he was one of the first to be elected to the Hockey Hall of Fame, earning entrance in 1945. In 1950, Morenz was voted the outstanding hockey player of the first half-century by Canadian Press. In a 1998 list compiled by The Hockey News, Howie was ranked the fifteenth greatest player of all-time. Howie's daughter Marlene married a hockey player  Bernie 'Boom Boom' Geoffrion. By a twist of fate, Geoffrion's number 5 was to be retired by the Canadiens on March 11, 2006. That same day, 'Boom Boom' succumbed to cancer. To honour the link between these two Canadiens stars, as Geoffrion's banner was being raised to the rafters, Morenz's banner was lowered halfway to the ice. As soon as Geoffrion's banner reached the same level as the banner honouring Morenz, the two were raised together.